Does your dog have a dog walker? is he happy to go for walks with him? does your dog walker do the extra effort to make sure your dog is happy? on today’s “Alpha Dog Blog” we are wondering what does, in fact, make a great dog walker? What are the qualities and characteristics he must have? We’ve asked Jason Meltzer, Co ­Founder & Chief Dog Officer of “Wag“, for his opinion. Wag’s mission is to make it much easier to own a dog by providing your dog the care it deserves while giving you the flexibility you deserve. Whether you need to find a dog walker instantly, or on a recurring basis, Wag has you covered! Hello Alpha Dog readers, Having been a professional dog walker for years, to owning my own dog walking business to co­ founding a startup built around dog walking I know what makes a good dog walker. I wanted to write this blog to share with you what Wag looks for in on­boarding dog walkers and what characteristics they must all share. Wag looks for dog walkers with experience as a pet professional. Our dog walkers are Registered Veterinary Technicians, Shelter Volunteers, foster parents, dog groomers, dog trainers or have their own dog walking small business. 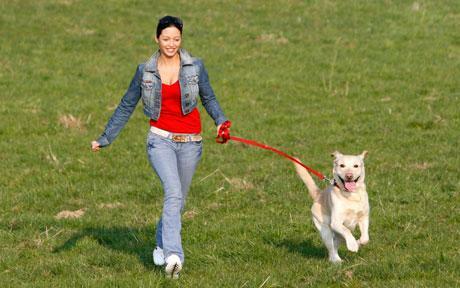 An experienced pet professional will know how to make the dog walk fun. With experience dog walkers know to bring all natural treats, how to deal with sluggish dog and how much energy each breed needs. A dog walker has to be accountable as the dog’s health and well being are in his/her control. Professional dog walkers always show up at the desired time and place and are responsible for bringing the dog home safe. Accountable dog walkers use calendars with set reminders to keep track of their schedule. Here is a tip, you can sync your scheduled walks in your calendar with Waze which provides traffic data. Waze will alert you of when you need to leave in order to make it to your dog walk on time. A good dog walker must be thorough in carrying out their duties. Dog owners will leave notes for the dog walker on health issues, triggers and preferences regarding their pets. A great dog walker makes sure to read all notes left from the owner before beginning the walk. The last thing you want is to have a dog walker who does not follow instructions to the T. When you leave notes that the dog must be created after the walk and the walker missed this detail and you come home to your Jimmy Choos all chewed up. For the fellas it’s like coming home to find a signed Michael Jordan jersey ripped up. Book certified dog walkers through Wag! on an on-demand, scheduled, or weekly basis. See your dog being walked with live GPS tracking. Know whether your dog took care of its business after every walk.